Home / how to / How to Add Social Media Icons to Blogger in just 5 minutes? How to add social media icons to blogger? This tutorial will help you add social media icons in the sidebar of your blog which will increase the probability of readers following you on various social networks. 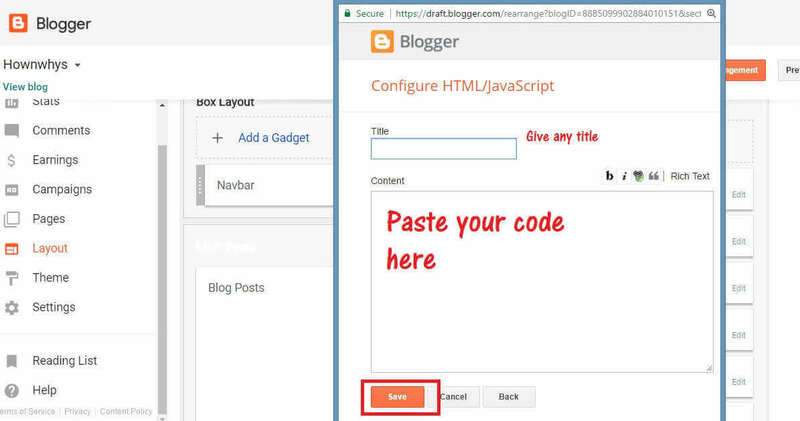 There are many ways to do it like adding new widget section to the blog header but now, you will be able to do this in a super easy way that too in just 5 minutes. Social media icons or social media badges are graphics that connect your social media account and helps your users to find you on social media platforms of which most common ones are Twitter, Facebook, Instagram, Pinterest, Youtube and lots more. Why is social media icon important? Since these icons connect your social media profiles with your website and give your users a comfortable one click access to your profile, therefore are vital for any blogger. Having a good quality social media icon helps in making a site's design complete and in a way it also helps in increasing your traffic. The people who enter your website through search engine would find that you are also available on other platforms and there are 90% chances that if they love your content then they would want to follow you on respective social media. Now that you know why you need social icons, the question arises - Where to find them? and How to add social media icons to your blog? The answer is super easy. You can download free social media icons from Google. There are plenty of different varieties of social icons available on the internet. These may vary in shape, colours, size and quality. You can even create icons if you love to be more personal and creative with your website, although I would recommend you to search for free social icons because there are so many irresistibly lovely designs already uploaded on the internet. How to add social media icons to a website? Let us begin adding social icons to your website and believe me it will take just 5 minutes. All you have to do is just follow me step by step. In this step I want you to open a new MS-Word document or a notepad and copy paste the code given below. Note: Paste this code as many times as the number of social icons you want to add. For example, you want to add 6 icons then paste this code 6 times in your word document. 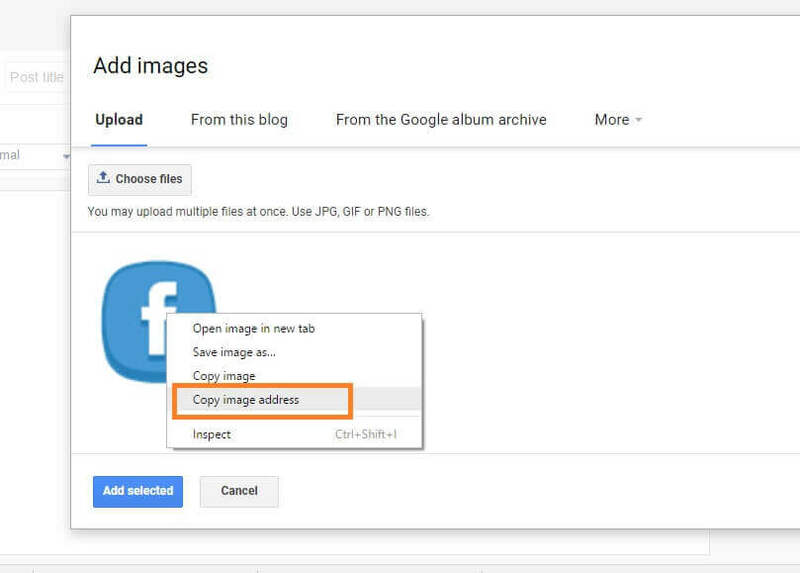 Download a set of social media icons you want to upload to your blog. If you like vector social media icons, like the ones you see on the right sidebar of hownwhys.com, then you can download them from here. If you want to see more designs then click here. After downloading the icons come back to your workspace on blogger. Click on NEW POST and then select Insert Image option. A dialogue box appears. Here click on Choose Files. Select the icon of your wish, let's say you select the Facebook icon from the downloaded folder and upload it. Now before clicking on Add selected, right click on the image uploaded and select "Copy Image Address"
Paste the copied image address in place of "PASTE IMAGE ADDRESS HERE'' shown in step 1. Now go to your Facebook page or profile and copy the URL from the address bar of your browser. Paste this URL in place of "YOUR SOCIAL PROFILE URL HERE". Note: You have to paste the image address as well as URL inside the double quotes. Note: You have to repeat this process for each social media icon you want to add to your website. Now when you are done editing the code copy it and come to Layouts Tab in your blogger workspace. Go to the sidebar and click on Add Widget and select HTML box. Paste the code in this box and click on save. Now click on Save arrangement. Now open your website and voila! You got your beautiful social icons ready. Test them and tell me in comments how is it going. If you want your icons to open in new tab then you can add target="_blank" after your Profile URL as shown in the box below. Now you are done with the process, I hope you like this article on " How to add social media icons to blogger". Also if you have any further queries you are most welcome, just leave your queries below and I will be there to help. What are the companies which provide best web hosting services under $4? I have tried it but what i got was a bit clumsy in the sense all the icons occured at once in four places. I am sorry I am not able to understand your query. Can you mail us any screenshot of what exactly went wrong? Also, do send a screenshot of the code, just so that I can understand better. Mail Us at hownwhys@gmail.com.